Sound "Along with extended, clear, and clean highs came a higher level of weight and dimension"; "liquid smoothness and lack of grain are hallmarks of this preamplifier"; "has the rare ability to convey all the recorded detail in a naturally balanced manner and with the emotion and feel of the music intact." Features Remote-controlled line-stage preamp with premium parts and clean, unadorned look; balanced and single-ended-only versions, along with a separate tubed model. Use Quibbles were few -- "the MSD-P2000b was mostly a joy to use." Value "A ridiculously high level of performance for its lower-range price." I bet most of us think back to when we first started our careers, whatever they may be, and wince at how misguided, uninformed, and perhaps even downright dangerous we once were. It almost makes me wonder how the world can survive the constant influx of neophytes that plague us all with their misinformation as they gain real-world experience. Case in point: When I first started taking audio seriously about ten years ago, if you would have asked me what the least-important part of a stereo system was I probably would have said cables. But one notch up the line from cables would have sat the preamplifier. I mean, what does the preamp do anyway? It simply routes signals from one place to the other with a modicum of gain and a volume control stuck in between for good measure -- kind of like a middle man with a big mouth, or so I thought at the time. Ive since changed my tune significantly and now consider the preamp to be firmly in the top two or three spots in terms of defining the quality and character (or lack thereof) of a given system. Of course there are those who preach that the only good preamplifier is no preamplifier, but that can lead to other issues and complications at one end of the system or the other and can largely negate the "benefit" of not having a preamplifier in the first place. And you are limited to one source component sans preamplifier. Then there are those in-betweeners who actively support the use of a passive preamplifier if you absolutely, positively must have something between source and amplifier. In any case, in my book the choice of a preamplifier (or the choice of not using a preamplifier at all) will be one of the most important decisions made in the building of a high-quality audio system. The "b" of Marsh Sound Designs MSD-P2000b ($1495 USD) stands for balanced, although there are single-ended connections as well. Marsh also offers a single-ended only version called simply the P2000 ($1195), and a tubed version called the P2000t ($1495). The MSD-P2000b's design is very clean, simple, and tasteful. There are no flashing lights or myriad tiny buttons or switches, and the unit itself is slim, measuring 3 5/8"H x 19"W x 13"D and weighing a very manageable 11 pounds. I like slim preamps -- they give me a visual cue that they arent doing much to the sound, and thats what I want out of a preamplifier. A big, hulking preamplifier makes me think, "Whats going on in there? Why have all that space if youre not doing something to the sound in there?" Anyway, the MSD-P2000b's front surface is brushed aluminum with three truncated oval knobs for adjusting volume, balance, and input source, and there are two buttons for power and the tape monitor. All these functions are controllable via the "economically" designed small plastic remote control that will not impress your friends and doesn't suit the attractive styling of the preamp itself, but it works very well nonetheless. The volume knob moves up and down in utter silence, and the source knob engages with a reassuring and satisfying clunk. All in all there is a nice look and feel of quality about the MSD-P2000b as a whole. On the back panel there are the usual suspects including single-ended outputs, six line-level inputs, and a set of tape outputs. And of course given that the MSD-P2000b is a balanced design, there is one set of balanced inputs and a set of balanced outputs. The MSD-P2000b is said to be discretely balanced from stem to stern, so apparently theres no funny stuff going on here in terms of some quasi-balanced design. Lastly there is an IEC receptacle, so youre free to spend more money on expensive power cords. I just stuck with the stock cord during the review. Audiophiles may be familiar with Richard Marsh through his electronic-parts business. Many of these parts find their way into some of the industrys pricier offerings from companies such as Audio Research and Wilson Audio, but with the MSD-P2000b, you get Marshs proprietary output stage and highly regarded capacitors on the relative cheap. Bonus! As far as the specs go, the MSD-P2000b's input impedance is 50k ohms, and the A-weighted S/N ratio is 98dB. 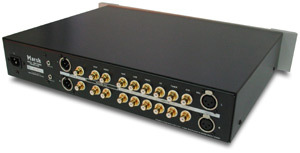 Maximum gain is internally selectable at 14dB or 10dB, and maximum output at 1kHz is 6V. In daily operation, the MSD-P2000b never got more than slightly warm no matter how long I left it on. My quibbles on the design and operation fronts are few. As with the Marsh A400s amplifier I reviewed previously, the MSD-P2000b's blue power indicator light glows a little on the bright side so as to be a distracting in low-light situations (you know youre searching when you bring up stuff like this). And although the aforementioned tiny remote is perfectly functional, the buttons are all the same size and closely spaced. So despite a logical layout that precludes most errant remoting, I still occasionally adjusted the balance instead of the volume. Lastly, because I have one system for both stereo and home theater (oh relax -- the emphasis is squarely on audio, and I move the TV out of the way when things get serious), it would have been convenient to have a home-theater pass-through function so I didnt have to readjust the volume every time I switched back and forth between music and movies. Thats pretty much it in the quibble department, which is to say the MSD-P2000b was mostly a joy to use. Things that make you go "ooohhh"
Ive come to realize that I have two basic reactions to new audio gear when its inserted into my system for the first time. The far more common reaction is to immediately go into analysis mode and start to identify each aspect of sound that has changed with the insertion of the newcomer. But every once in a very rare while I install a piece of equipment and the only thing that comes to mind is "ooohhh." What "ooohhh" usually translates to is obvious improvements in several areas at once accompanied by a marked increase in overall coherence, involvement, and realism. The MSD-P2000b rated a serious "ooohhh." Loudspeakers  Soliloquy 6.2, Thiel CS1.6. Preamplifier  Rotel RSP980 preamp/processor. The first thing I check when components sound so eminently musical right off the bat is whether detail is being conveyed cleanly and clearly or whether there is some cover-up action going on to mask inherent shortcomings. One disc that will explore the extremes of your system is Steve Coleman and Five Elements' Def Trance Beat (Modalities of Rhythm) [Novus 63181]. The highs are very extended and open but the cymbal crashes become a bit smeared when really whacked. Ive had preamplifiers in my system that did a good job with this, but at the expense of some of the air and reverb as well as some transient bite, so while there were clear improvements in some areas, there were significant tradeoffs in others. Not so with the Marsh MSD-P2000b. Along with extended, clear, and clean highs came a higher level of weight and dimension that took my level of understanding and involvement in this disc to new heights. In addition, the slaphappy bass-guitar lines still had their bite, the drumstick/snare-head interaction was still readily discernable, and echoes still trailed nicely into nothingness. In short, I did not get the feeling I was experiencing any artificial roll-off or veiling despite the obvious improvements in refinement. In fact, liquid smoothness and lack of grain are hallmarks of this preamplifier, and they evidenced themselves on every recording I threw at the P2000b. Tonality also took a nice leap forward, and on "Flint" from the same disc, this actually helped me more easily identify the closely spaced dueling saxes, as their respective differences in character became much more apparent. Whereas before I had to focus on splitting the pair in a fine, two-dimensional plane, now the roundness of tone helped separate them out in more of a three-dimensional perspective. These are the kinds of qualitative differences I find with better audio products -- that through their more complete and unfettered presentation they make listening to music more effortless and thus more involving. It was these qualities that begged me to put on Diana Kralls Love Scenes [Impulse! 233] to see how the nuances and weight of Krall's closely miked vocals would come through. With less-refined gear, this recordings strengths can easily become weaknesses, as sibilance and Kralls own breath can become distractions rather than seamless parts of a whole that aid in the illusion of physically bringing the singer into the room. As with the Coleman disc, there was a liquid, buttery smoothness about Kralls vocals combined with gobs of tonal weight such that on "Gentle Rain" I could literally feel the vibrato of her voice from my listening chair. Talk about involving! And all this did not come at the expense of fine detail. I could still readily hear the subtle click of parting lips and the interaction of tongue and mouth (easy, guys). The reverb trails created by snapping fingers on "My Love Is" were nice and crisp without vanishing prematurely. Another strength of the MSD-P2000b is its ability to portray the soundstage. I noticed right away on John Scofields Steady Groovin [Blue Note 99257] that there was simply more volume to the stage as a whole, and even individual instruments expanded within their own space. Scofields guitar exuded a roundness of tone that expanded proportionally in all directions and dimensions, bringing the instrument and the performance more to life. Also notable and indicative of the MSD-P2000bs overall level of refinement, the hi hat on "Chariots" floated delicately in its space at the left rear of the stage, which is in contrast to the more forward and intrusive presentation I had been accustomed to. On "Lazy," the Marsh preamp nailed the acoustic guitar, yielding a perfect balance between fingers, strings, and the hollow body -- again showing off the preamp's ability to do detail in a complete yet realistic way. And then there was the sense of the music having a solid foundation underneath it. This is hard to describe, but as I was listening I always had the sense there was something underlying the music that I could feel and hold onto as opposed to a lighter, less-grounded performance. I think it might have to do with the lower mids and bass being allowed their full due, but whatever it was made it easier for me to lock onto the music. However, this may also come at a cost. On "Kool," the bass lines exhibited a bit of bloat, which gets to the only real area of concern I have about the MSD-P2000b' sonics. This did not surface frequently, and changing cables did help, indicating it could be a component-interaction issue, but nonetheless this bit of low-end emphasis may be something to listen for. On the Gladiator soundtrack [Decca 467094] the bass proved to be a strength, especially toward the end of "The Battle," where the deep bass drum roll provides an ominous underpinning, heightening the emotional impact of the piece. One thing I noticed on this recording is that the brass tends to sound a little zippy, and the Marsh preamp did not do much to sugarcoat the situation, although it did sound better than with less-robust-sounding preamplifiers Ive had in my system. Once again the MSD-P2000bs ability to image came through nicely, as the trumpets entered softly from the rear of the stage and other individual instruments appeared all throughout a black, three-dimensional space. That last point also deserves special mention, as the P2000b always provided a silent backdrop upon which the music was allowed to fully surface, enabling the listener to discern the smallest nuances and dynamic contrasts. Any nits I have to pick are solely at the extremes. As mentioned earlier, there are certain songs with low bass that did not track particularly well through the Marsh preamp, but there are some variables within my system along with my infernally square listening room that could be contributing here. At the other end of the spectrum, although the Marsh preamp does detail extremely well, I could maybe use just a touch more air and perceived transparency at the very top. Then again, every preamplifier Ive heard that is more airy is also more etched, forward, and grainy, so maybe more air is just a distortion or a pipe dream -- or maybe thats what you need to pay the big, big bucks for. Suffice it to say the MSD-P2000b made quick work of my longtime Rotel RSP-980 preamp/processor. Although the Rotel actually offers a little more detail and air, it seems a little overdone by comparison, and the quality of the detail is not to the level of the MSD-P2000b. It's more stark, not nearly as naturally evident. From the mids on down, the Marsh preamp is simply a more complete product, making the Rotel preamp sound thin and closed-in by comparison. The closest competitor Ive had to the Marsh MSD-P2000b in my system is the very accomplished McCormack RLD-1. There were far more sonic similarities than differences between these two units, with the major difference being that the Marsh seems to offer a little more transient snap and transparency up top. However, with its home-theater pass-through feature, optional phono section, and dual digital volume displays, Id have to give the nod on features and flexibility to the McCormack, but it is also priced several hundred dollars higher than the Marsh MSD-P2000b. Both are excellent products and rate very high on the performance-per-dollar scale. The Marsh MSD-P2000b offers a ridiculously high level of performance for its lower-range price. There might be preamplifiers out there that have a more iron-fisted grip on bass or float even airier highs, but many of those will likely involve compromises in other areas or cost several times the asking price of the Marsh MSD-P2000b. In addition to exuding the look and feel of quality at every turn, the MSD-P2000b simply delivers music. Some preamplifiers are great at resolving detail but sound cold and sterile, while others sound very pretty but are not faithful to the recording. The MSD-P2000b has the rare ability to convey all the recorded detail in a naturally balanced manner and with the emotion and feel of the music intact. The result is pure and effortless sonic indulgence.